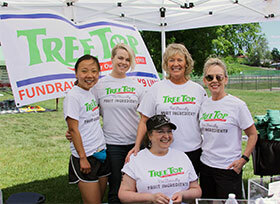 Founded to reduce food waste and provide ongoing profits to local growers, Tree Top’s sustainability efforts have always been more than a buzzword. SEEKING A DONATION FOR A QUALIFIED CHARITABLE ORGANIZATION? 1) Support is primarily contained within central and southeastern Washington State where the majority of Tree Top growers and employees reside. 2) Support is primarily provided to charitable 501c(3) organizations with a youth-based focus and educational institutions. Organizations considered integral to the quality of life within a community may also be considered. 3) Support is NOT provided to individuals, and individual teams, a troop, a student trip, or to a school’s sports, poster, or yearbook as there are simply too many requests to make a fair allocation. 4) Support is NOT provided to political, controversial, or religious organizations. A program operated by a religious organization to assist those less fortunate or benefitting the greater community may be considered. 5) Support is generally limited to one program or event/year by any single organization.